Glaucoma is a disease of the optic nerve – the part of the eye that carries the images we see to the brain. The optic nerve is made up of many nerve fibers, like an electric cable containing numerous wires. When damage to the optic nerve fibers occurs, blind spots develop. These blind spots usually go undetected until the optic nerve is significantly damaged. If the entire nerve is destroyed, blindness results. Early detection and treatment by your ophthalmologist are keys to preventing optic nerve damage and blindness from Glaucoma. Loss of sight from Glaucoma can often be prevented with early treatment. Because the eye is a closed structure, if the drainage area for the aqueous humor – called the drainage angle – is blocked, the excess fluid cannot flow out of the eye. Fluid pressure within the eye increases, pushing against the optic nerve and causing damage. Chronic open-angle Glaucoma is the most common form of Glaucoma in the United States. The risk of developing chronic open-angle Glaucoma increases with age. The drainage angle of the eye becomes less efficient over time, and pressure within the eye gradually increases, which can damage the optic nerve. In some patients, the optic nerve becomes sensitive even to normal eye pressure and is at risk for damage. Treatment is necessary to prevent further vision loss. Typically, open-angle Glaucoma has no symptoms in its early stages and vision remains normal. As the optic nerve becomes more damaged, blank spots begin to appear in your field of vision. You typically won’t notice these blank spots in your day-to-day activities until the optic nerve is significantly damaged and these spots become large. If all the optic nerve fibers die, blindness results. This is a true eye emergency. If you have any of these symptoms, call our office immediately. Unless this type of Glaucoma is treated quickly, blindness can result. Your ophthalmologist will weigh all of these factors before deciding whether you need treatment for Glaucoma or whether you should be monitored closed as a Glaucoma suspect. This means your risk of developing Glaucoma is higher than normal, and you need to have regular examinations to detect the early signs of damage to the optic nerve. As a rule, damage caused by Glaucoma cannot be reversed. Medications (eyedrops), laser surgery, and surgery in the operating room are used to help prevent further damage. In some cases, oral medications may also be prescribed. • Medications: Glaucoma is usually controlled with eyedrops taken daily. These medications lower eye pressure, either by decreasing the amount of aqueous fluid produced within the eye or by improving the flow through the drainage angle. • Laser Surgery: Laser treatments may be recommended for different types of Glaucoma. In open-angle Glaucoma, the drain itself is treated. The laser is used to modify the drain (trabeculoplasty) to help control the eye pressure. In closed-angle glaucoma, the laser creates a hole in the iris (iridotomy) to improve the flow of the aqueous fluid to the drain. • Surgery: When surgery is needed to treat Glaucoma, your ophthalmologist uses fine microsurgical instruments to create a new drainage channel for the aqueous fluid to leave the eye. Surgery is recommended if your ophthalmologist feels it is necessary to prevent further damage to the optic nerve. As with laser surgery, surgery in the operating room is typically an outpatient procedure. With any type of Glaucoma, periodic examinations are very important to prevent vision loss. Because Glaucoma can progress without your knowledge, adjustments to your treatment may be necessary from time to time. 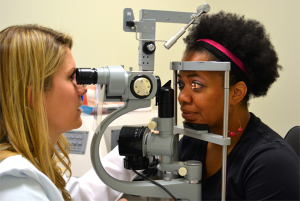 Glaucoma treatment requires teamwork between you and your doctor. Your ophthalmologist can prescribe treatment, but only you can make sure that you follow your doctor’s instructions and use your eyedrops.